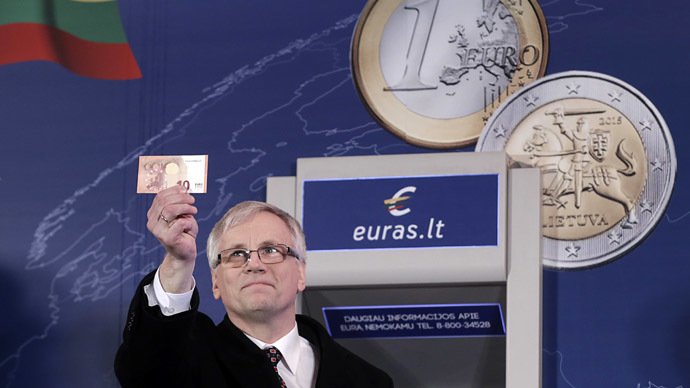 Lithuania has celebrated the New Year by joining the eurozone. The decision is country’s bid to boost stability despite inflation fears and euro zone debt troubles. However, according to a November poll about 40 percent of the population opposed the move. Lithuanian Prime Minister Algirdas Butkevicius was withdrew his first 10 euro from Vilnius cash machine right after midnight January 1. The exchange rate is now set at one euro for 3.45 litas, the country’s old currency. Both litas and euros will circulate in the country till June. "The euro will serve as a guarantee for our economic and political security," Butkevicius said at a ceremony which was attended by officials of other Baltic states - Estonia and Latvia. Latvia joined eurozone on January 1, 2014 despite opinion polls showed that a majority of the country’s population opposed the move, with just one-fifth strongly in favor. Estonia joined the currency bloc in 2011. "Myself, and I think, many of you feel sad that the litas, which has served us well for more than two decades, becomes history, but we have to move forward," said Lithuania's Finance Minister Rimantas Sadzius at the ceremony. However, not everyone in Lithuania shared the optimism of Grybauskaite. According to a November survey released by the central bank, only 53 percent of the population supported the move, while 39 percent were against. "Financial commitments are a huge burden and increase the country's debt. I think we should have delayed entry," financial analyst Valdemaras Katkus told AFP. In the meantime the European Commission has put a huge banner over its headquarters in Brussels, saying "Welcome to the euro area, Lithuania!" Lithuania has already donated millions of euros to the eurozone's rescue fund for struggling EU members, such as Greece.